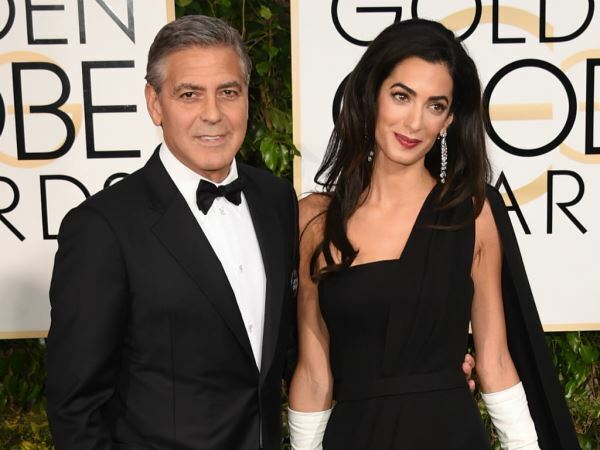 George Clooney thinks his wife Amal is an “amazing human being”. The 53-year-old famous former bachelor wed British lawyer Amal in September 2014. And opening up about just what made him fall in love with the stunning 37-year-old, George admits there is more than just one reason for the strength of his feelings towards his spouse. “She's an amazing human being," he said during an interview on Entertainment Tonight. "And she's caring. And she also happens to be one of the smartest people I've ever met. And she's got a great sense of humour. There's a number of reasons why." While Amal is married to one of the world’s most famous actors, she enjoys a successful career herself as a human rights lawyer. She is currently involved in two high profile cases – representing Armenia as they launch their case against Turkish Workers’ Party leader Dogu Perinçek, and attempting to help Greece win their case against the British Museum in London to return the Parthenon Marbles to their home. George, who has a strong interest in international affairs himself, added in the interview that he’s incredibly proud of the work his wife does. "I'm always very proud of her when I see her speaking at the International Court of Appeals in Strasbourg, you know, with her robe on," he said. "It's very impressive." However, he joked that the robe she wears in court – a simple black design – could be “spiced up”. Amal has made a name for herself as one to watch in the fashion world since she first hit headlines as George’s love interest. And even dapper George himself is jealous of his wife’s fashion sense.